Bell’s palsy is a condition that causes a temporary weakness or paralysis of the muscles in the face. It can occur when the nerve that controls your facial muscles becomes inflamed, swollen, or compressed. It also called “facial nerve palsy”. The condition causes one side of your face to droop or become stiff. You may have difficulty smiling or closing your eye on the affected side. In most cases, Bell’s palsy is temporary and symptoms usually go away after a few weeks. Although Bell’s palsy can occur at any age, the condition is more common among people between ages 16 and 60. Bell’s palsy is named after the Scottish anatomist Charles Bell, who was the first to describe the condition. 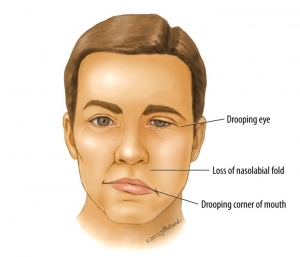 Bell’s palsy occurs when the seventh cranial nerve becomes swollen or compressed, resulting in facial weakness or paralysis. The exact cause of this damage is unknown, but many medical researchers believe it’s most likely triggered by a viral infection. Electrical stimulation therapy which can try and mimic these electrical impulses and help restore muscle tone. The therapist will note whether the facial muscles are weak. Educate you about how the facial nerve works and how it recovers plays a very important part in the therapy. Massage to keep the muscles mobile and healthy. Stretches to lengthen muscles which have become short or tight. Exercises to help relearn and develop balanced facial movements. Relaxation of your facial nerve and muscles.